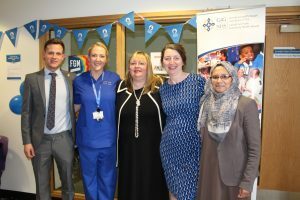 This week, Cardiff and Vale University Health Board (UHB) has launched Wales’s first Specialist Female Genital Mutilation (FGM) Pilot Clinic. The specialist service known as the ‘Women’s Wellbeing Clinic’ will be open to all females affected by FGM or who are at potential risk of FGM occurring. The cultural practice of FGM is widely associated with profound health implications for all females affected and has no health benefits. Until now, females left with both the physical and psychological scars of FGM have not had access to specialist services in Wales. The Midwifery-led FGM Service will be led by Emily Brace, Specialist FGM Midwife, working in close collaboration with the Consultant Obstetric Team, Designated Child Health Consultant Paediatricians and Third Sector Agency Support. The clinic will be staffed exclusively by females and held weekly, every Wednesday, at Cardiff Health Access Practice (CHAP), Cardiff Royal Infirmary (CRI). Anyone affected by FGM or seeking advice around FGM can self-refer into the clinic or can be referred via a health clinician, third sector agency, the police or social services with the individual’s prior consent. Any child cases will be seen in a separate clinic, which will run adjacent to the specialist FGM service by the UHB’s Designated Child Health Consultant Paediatricians. The clinic will work within National Guidelines and Clinical Standards for Specialist FGM Services, facilitating both the physical and psycho-social elements of care. This includes access to psycho-sexual counselling, interpretation services, as well as community advocacy support. Women’s wider health needs will also be addressed, including an opportunity to access cervical screening, breast screening and contraceptive advice. It is hoped that the clinic will be a trailblazer for best practice across Wales. 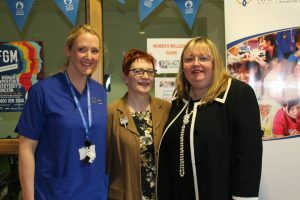 The clinic received funding from the Iolanthe Midwifery Trust, a registered charity that aims to promote and improve the care of mothers, babies and families through awarding grants and fellowships in support of midwifery education, practice and research. The Jean Davies Award is made in honour of Jean Davies who served for many years as a Trustee of the Iolanthe Midwifery Trust, stepping down in 2012, and in various roles for the RCM during her career. Jean’s focus in her work as a practising midwife and researcher was to help those families experiencing social and economic disadvantage, mainly in her home region, the north-east of England. The Jean Davies award is intended to fund individuals or teams working specifically to reduce or to investigate inequalities in maternal health. Kim Ann Williamson, of the CPS, said: “CPS Cymru-Wales has worked with several partner agencies from the early planning stages of this really important clinic. “It is satisfying to see all that work come to fruition with the opening of the first clinic of its kind in Wales. Mutale Merrill, Chief Executive of Bawso, said: “Since 2013, Bawso has supported 220 victims of FGM. Bawso has campaigned to have an FGM Clinic in Wales, and we are pleased this is now being launched. It’s a vital service for women who are victims of FGM and will form part of the integral service provision. Bawso will continue to work with Cardiff and Vale UHB and other partners to ensure women can access appropriate and timely services”.